Mother to two children raised raw vegan, Award-Winning Author, Internationally Acclaimed Speaker and Raw Food Coach, Karen Ranzi, authored Creating Healthy Children: Through Attachment Parenting and Raw Foods in 2010 and Raw Vegan Recipe Fun for Families: 115 Easy Recipes and Health Tips for Energetic Living in 2014. Karen was awarded the Peer-to-Peer Award for Service to Children’s Health and The World Peace Award by the 2014 Raw Living Expo in California. She was also awarded with the Best of Raw Top Professional Simple Raw Food Chef at the Raw Living Expo 2014. 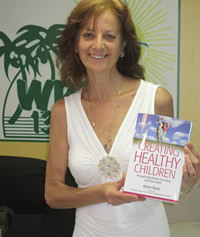 Karen’s book Creating Healthy Children won the Bronze Medal “Living Now Award” in the Category of Health and Nutrition by Independent Publishers. Karen Ranzi is a raw food nutrition coach, and also a coach for families with children on the autism spectrum. Her upcoming third book will focus on nutrition for autism. 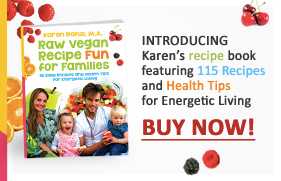 Karen has been interviewed on numerous TV and radio shows on the topics of the vegan and raw food lifestyle, and vegetarian and raw food parenting as well as attachment parenting, and on talk shows of the Gary Null Progressive Radio Network. Karen appeared as one of 40 raw food leaders on host Steven Prussack’s RAWpalooza Raw Food World Summit in January 2012 and again in April 2012 on Interviews with the Raw Food Masters. She was a featured speaker on the “Conscious Foods Summit” broadcast worldwide in February 2012. Karen has been interviewed on numerous other online Summits in 2013, 2014, 2015, 2016 and 2017 including the RAWmazing Life Summit, the Raw for Life Summit with over 20 vegan and raw vegan leaders, the Conscious Mothers Summit, the Vitality Health Summit and the International Raw Food Summit. Karen has traveled widely on talk and book tours on a mission to educate her audience on the benefits of the raw food lifestyle and attachment parenting. Karen has presented her classes “The Raw Food Challenge,” “Super Healthy Children,” “Eating for the A’s,” “Nourishing Ourselves, Nourishing Our Families,” and “Regenerative Foods for Energy and Weight Loss” at numerous seminars, schools, universities, health institutes and festivals throughout the United States and abroad. Karen was the keynote speaker at “The Children’s Health Congress: Flowers of Life” in Pereslavl, Russia, south of Moscow, in June 2012, organized by the Russian Association of the Raw Food Movement and Naturopathy. Karen will be traveling to China July and August of 2017 for a 6-city speaking tour and three raw food retreats. Karen has written articles for Get Fresh! 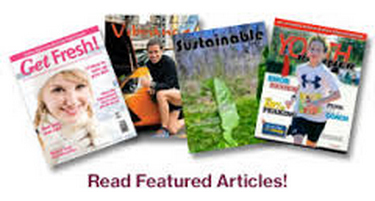 Magazine, Vegan Health and Fitness Magazine, VegWorld Magazine, Eternity Watch Magazine, Vibrance Magazine, Healing Our World Magazine, and Super Raw Life Magazine, and numerous other publications spanning two decades. Karen has completed many U.S. talk and book tours and is an annual featured presenter at the London VegFest, and a Pioneer Presenter at the Woodstock Fruit Festival annually each August since 2011. Karen also hosts events for other leading health and nutrition presenters through her New Jersey Raw Food Support Network on www.Meetup.com/new-jersey-raw-food-support/. In addition to her work in nutrition, Karen holds a Masters degree in speech pathology from New York University, and is a speech/language/feeding therapist working with children of all ages for 40 years, specializing with autistic children since January 2002. Every June, Karen supervises twenty speech pathology graduate students from Northeastern universities as they work with autistic children at Camp Kaleidoscope of Vermont, a unique camp program for autistic children and their families. Karen increases her students’ awareness of the impact of whole food plant-based nutrition on the children’s health and wellbeing, which includes the benefits of a gluten-free/dairy-free lifestyle, eliminating processed foods and eating more fresh raw plant foods. In 1994, Karen was able to heal her three year old son from asthma, chronic ear infections and multiple allergies, and herself from digestive and skin problems through dietary and lifestyle changes. By means of her education, life-changing personal experiences, and sincere desire to share her message, Karen has been able to guide thousands toward developing excellent health. 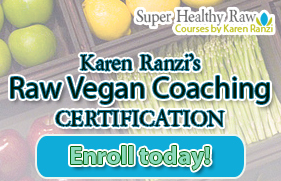 In 2015, Karen launched her Super Healthy & Raw Academy online raw vegan coaching certification course. Students who have taken the course up to this date are from the United States, UK, Japan and Canada. To find out more or to register, go to www.SuperHealthyRaw.com or contact Karen at karen@superhealthychildren.com. If you are looking for help in creating health, Karen’s coaching and classes provide you with the support for success. You may choose in-person, phone or Skype consultations. Karen also gives live raw food coaching and recipe programs in New Jersey. Each person has their own lifestyle background. Karen is able to individualize your needs and assist you from whatever dietary and lifestyle path you have been following. If you would like Karen to speak for your group or to schedule a private consultation or class, please email her at karen@superhealthychildren.com or call (201) 934-6778.